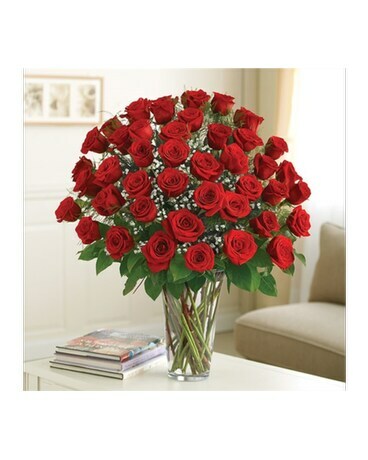 Your ultimate love deserves the ultimate gift -- four dozen of the freshest long-stem roses. There's no doubt who the love of your life is when you send this beautiful floral fantasy, hand-arranged in a striking glass vase. Choose from a variety of colors to express your feelings perfectly. Arrangement measures approximately 23"H x 18"L. Colors, varieties, and container may vary due to local availability.